I thought the Trilobite were ocean creatures? This is indeed a Trilobite. Either you are missing the tail half or this one was rolled into a ball. If the segments continue on the other side it is enrolled which was a defensive position. 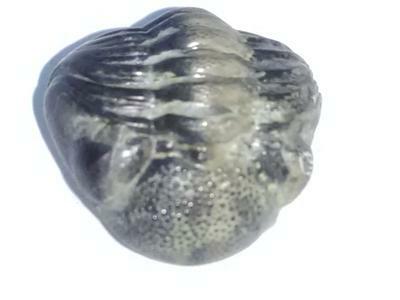 This type of trilobite is called Phacops. The picture shows the head. You can see the eyes set near the sides. If your fossil has excellent detail you will see that the eyes are multi-faceted like a fly.